CMD69273P-30NF 698-960/1710-2700 MHz Low PIM 2-Port MIMO Ceiling Mt Antenna - Talley Inc. The CMD69273P indoor broadband 2-port MIMO omnidirectional ceiling mount antenna is designed to provide pattern coverage that is optimized for indoor requirements at 698-960 MHz and 1710-2700 MHz for the CELLULAR, UMTS and LTE/WiMAX frequency bands. 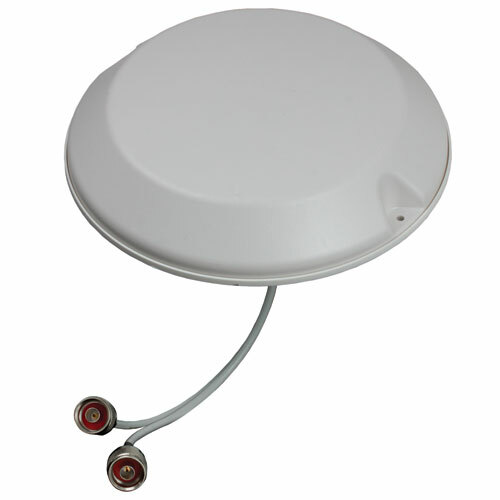 The individual antenna elements are designed with linear H/V-polarization components oriented to provide a pattern that has been specifically shaped to provide optimal performance from a ceiling mount location.